adidas HOME OF SPORT is currently located in a new building of Krylatsky Hills Business Park where it occupies 20,000 sq. m. Three of six floors house offices, two floors accommodate a fitness centre, and the adidas Academy is on the last floor. The architects from ABD architects were challenged to design a complex of spaces for different functions and purposes, to organize an understandable and comfortable structure and communication for various streams of visitors. When designing the interior, the architects sought to reflect the Adidas logo. On each floor at the same place, there are white capsule meeting rooms which, when seen from the atrium, resemble three iconic stripes. At the same time, when seen while walking about the floor, they resemble a well-known trefoil. Each of the three meeting rooms is installed at an angle, is made in black and white colours, and is well noticeable. When designing the interior, the architects also sought to reflect the company’s focus on active lifestyle and love for sports. For example, this led to the idea with scooters: on each floor there are tracks and parking lots — anyone can use scooters to move about the office area. Also this triggered the idea of a lighting pattern — a pattern of a traditional soccer ball. Most of the partitions on the office floors are transparent, and blank walls are decorated with adidas graphics and motivating quotes. The central part of the office floor is active in colour and in function: small and large meeting rooms, furniture for individuals to work, areas for informal socializing and networking, coffee points. Design of work stations in the areas located closer to the whole glazed walls with panoramic view on Moscow is calmer: white tables and black chairs. The tables are arranged very comfortably, there is enough space between the rows to accommodate mobile file pedestals with seat cushions on the top and to organize internal negotiations. In addition to stationary workplaces, in the office there are temporary workplaces with high tables and ergonomic bar chairs. Much attention in adidas HOME OF SPORT was given to the acoustic comfort: privacy screens and cubicle partitions; acoustical panels; additional meeting rooms are made of sound absorbing material. The central reception hall resembles a real sport stadium. The focus was made on a big media screen with a running text line and a display for videos, and two big lighting fixtures resembling lighting towers. Reception desk and turnstiles are in the depth of the hall and do not catch the eye as they usually do in traditional offices. From the main lobby people can access two shops, and, without passing through turnstiles, to the reception room of the fitness centre. The BASE, a premium class fitness centre, is made in the loft style: open communications, large industrial fans, brutal and monochrome colours. ABD architects acted in a highly professional and competent manner and were involved throughout the project from the early design stage till the final office opening. We are pleased to confirm the fit-out was completed on program and within budget. 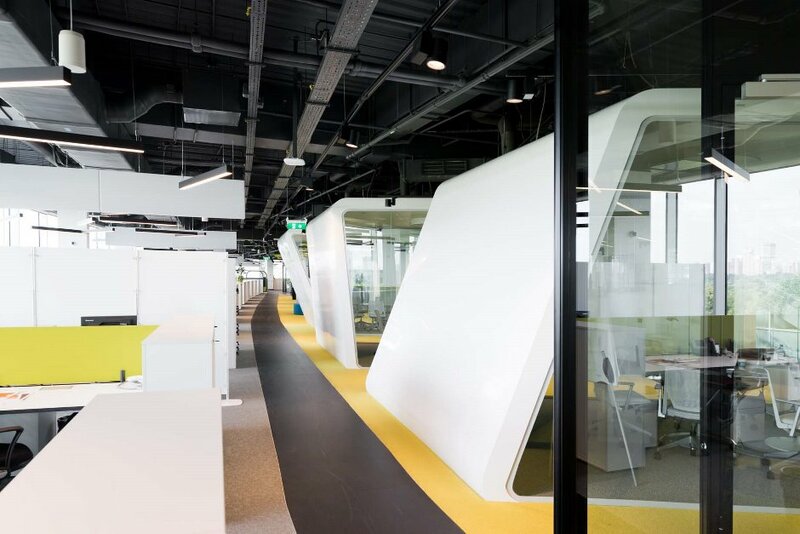 ABD architects’ design flair and detailed knowledge of the availability of suitable products including furniture and partitioning systems was vital in achieving the fit-out of our office which is of the highest standard in terms of both design and quality.